After last year’s debacle, seemed like doing something more reasonable for our annual Saturnalia day out would be a good idea. I lobbied for Keyhole or Behunin, but we settled on Fat Man’s Misery, with the possibility of exiting out the side early if conditions were unfavorable. Ram insisted on an early start, which left me, a night-owl, with about 4 hours of sleep. We bedded down at Susan and Tim’s house in Springdale and some people slept. Our crew for this day was Steve Ramras, Tre C Kwan, Jenny Mae West, Tim Hoover and myself. Away from the car at 5:04 – good. 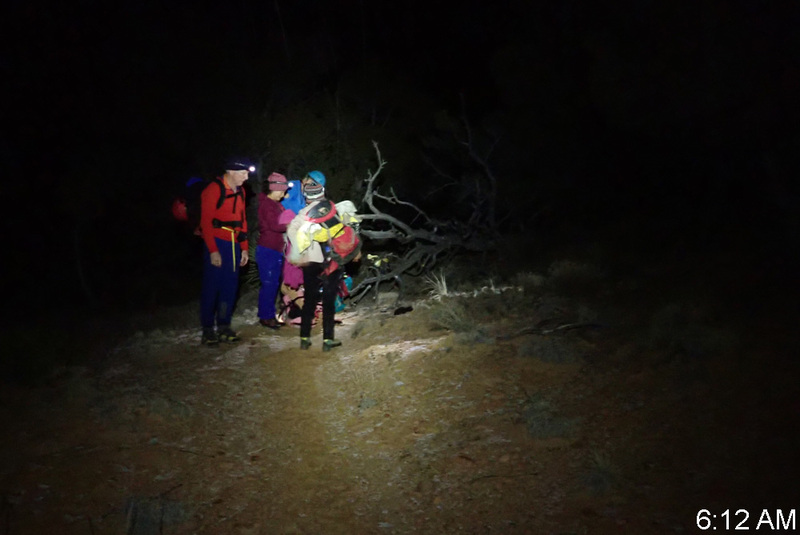 A bit of grapple occasionally sprinkled us on our headlamp hike, but we made good time. Being most familiar with the area, it was mine to navigate – harder in the dark. 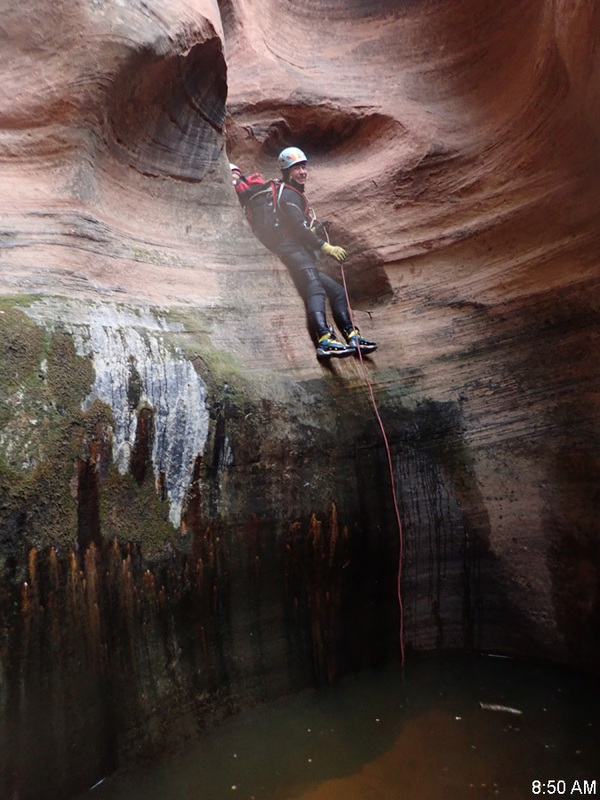 We wandered a bit, but finally found the canyon, arriving at the first rappel as the morning light came up. 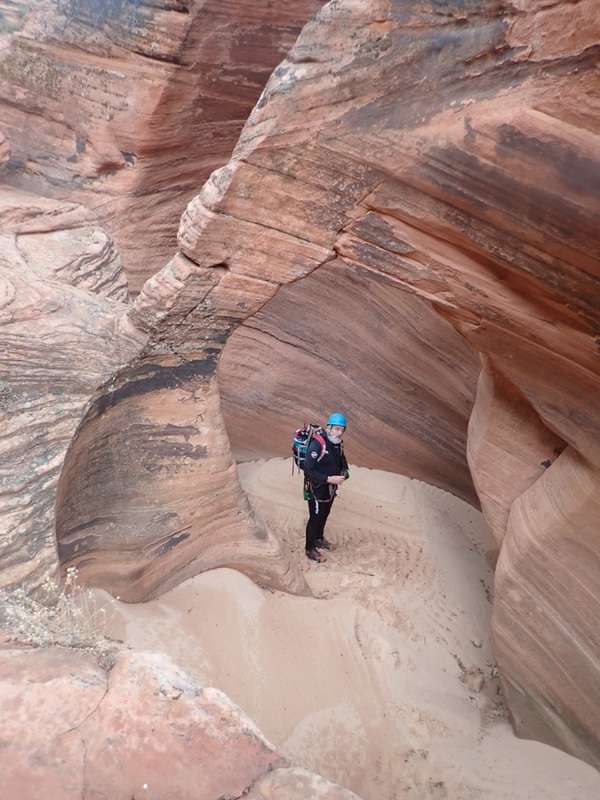 I was delighted to find the canyon much drier than expected… well, than *I* expected. 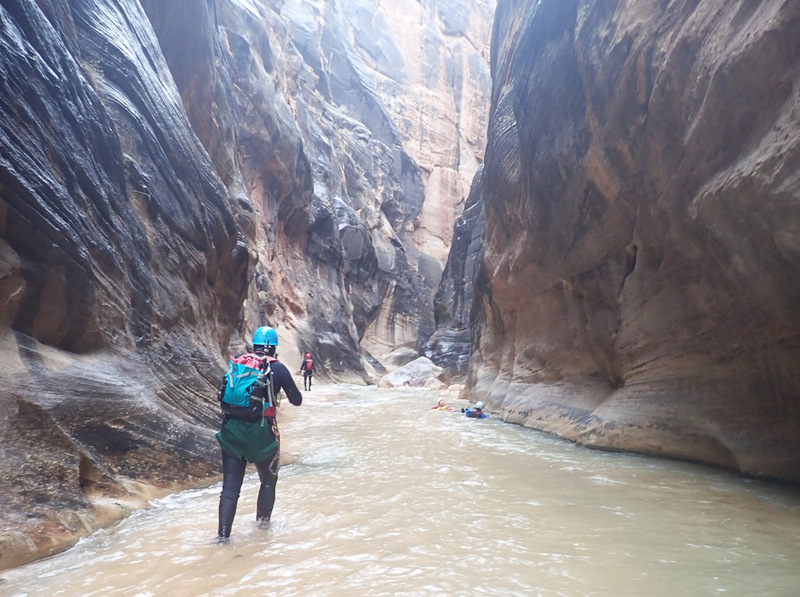 The first rap at a small puddle at the bottom, and the exit from that section of narrows was about knee deep. This was good. Fewer swims = less getting cold. There was a bit of snow on the ground, but not much. 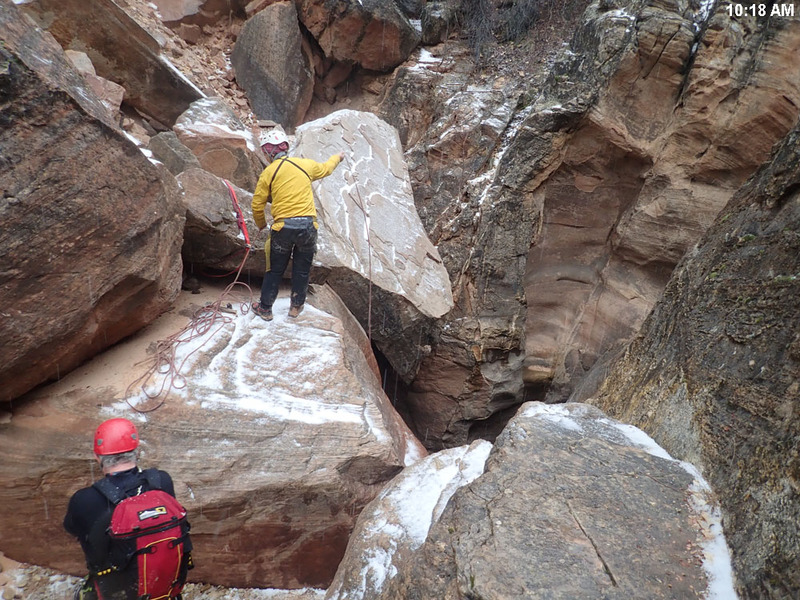 An occasional patch of ice on slickrock required constant vigilance. 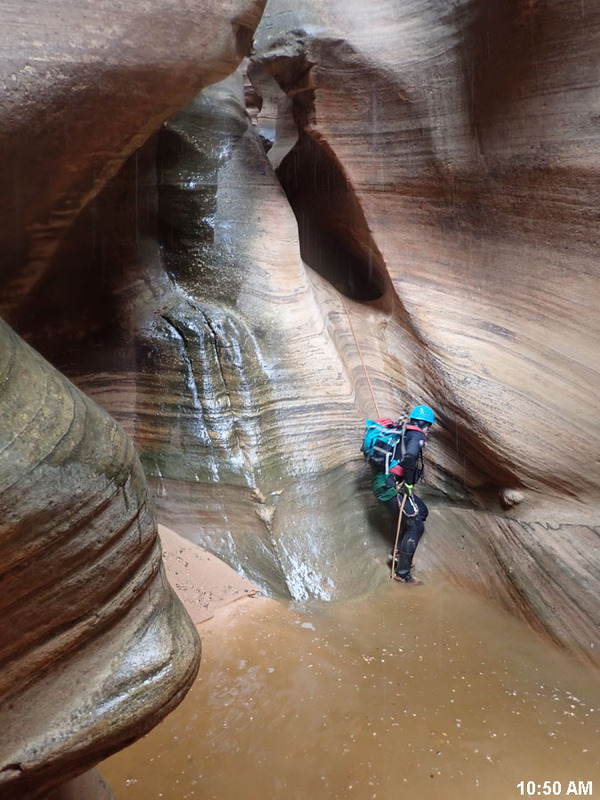 We worked through the canyon, and it was delightful. An excellent choice. Three brief swims did not chill us too much. The bonus hot spring at the final grotto was warm enough to feel good through our wetsuits. Briefly. Sliding in at the Grotto area. The usual East Fork siesta was unnecessary. We waded the East Fork to the exit peninsula and headed out. It started to rain. 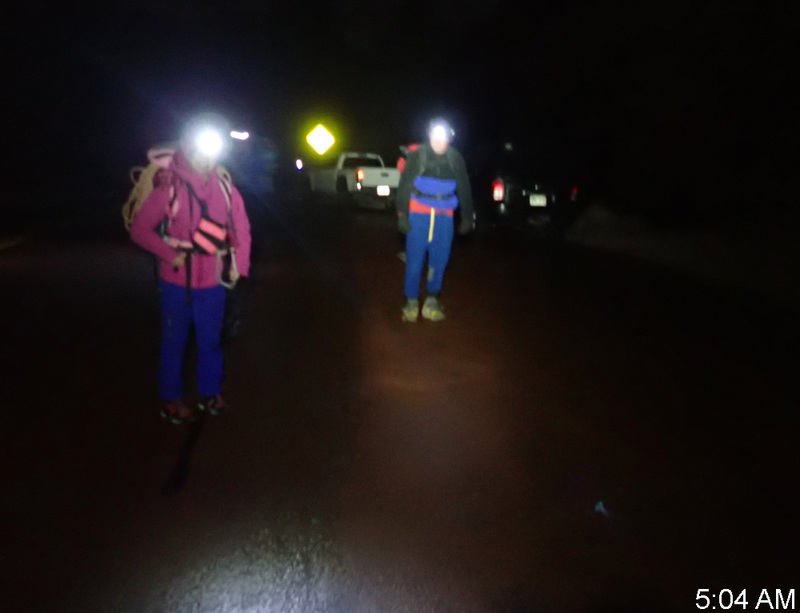 We changed out of wetsuits and put on our best freezing-rain hiking attire. And hiked. And hiked. And hiked. It is still quite a trudge out of there. Then it started to snow as we arrived at Checkerboard Pass. 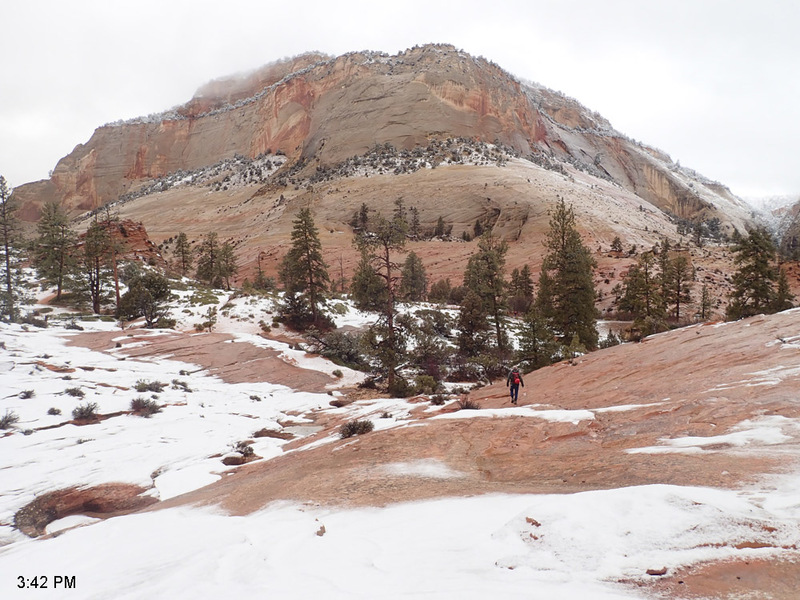 The technical crux of the day was descending the steep north side of the pass, now that there was an inch or two of light powder over the old snow over the steep sand. Super slippery. Ram put a hiking pole in my hand (thanks Ram) and we inched down the pass. I wiped out twice, thankfully so fast that I could not put a hand out. 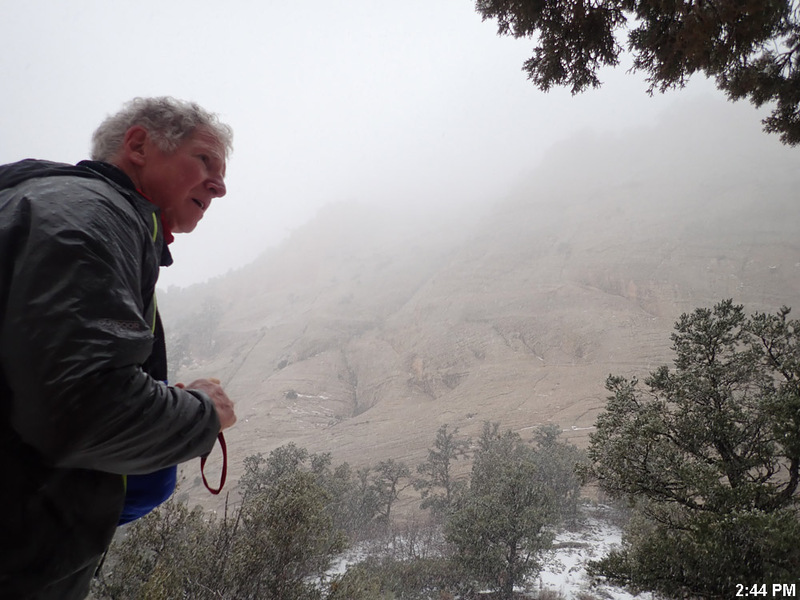 Eventually, the hill was descended and the hike out the wash tediously completed. We returned to Susan and Tim’s house for a wonderful Christmas feast. And went to bed early. This time, sleep was found quickly. A wonderful walk in a winter wonderland.